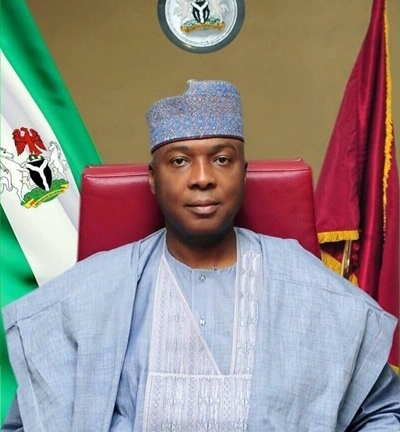 An attempt by lawmakers of the Nigerian Senate to install the Senate President, Bukola Saraki as the Acting President, where both Buhari and Osinabjo were not in the country failed at the National Assembly. A mild drama occurred on the floor of the Senate, on Tuesday, when a point of order was raised, that the Senate President, Abubakar Bukola Saraki was the Acting President of the Federal Republic of Nigeria, DailyPost reports. The Senate, upon resumption from its 3 weeks break, received a communication from Professor Yemi Osinbajo, the Acting President of Nigeria, seeking the confirmation of Lanre Gbajabiamila, as the Director General of National Lottery Regulatory Commission. This was greeted with a counter point, coming through order 53 rule 4 of the Senate standing rules, by Senator Kabiru Marafa (Zamfara Central).